The water is high and wild shiner bite is on fire here on lake Okeechobee! 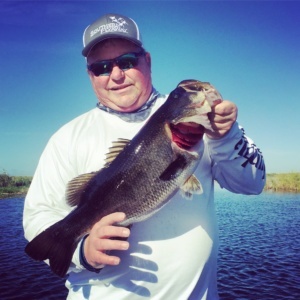 Here is Sam from south Carolina with a beautiful south Florida largemouth. We began our trip casting crankbaits around shell beds for some early morning schooling fish. After the sun came out we switched to using wild shiners to boat over 25 fish in 6 hours of fishing. In conclusion the day was a success and Sam was one happy fisherman! If your looking to get away from the cold and enjoy the beautiful Florida sunshine be sure CLICK HERE to book your trip today.